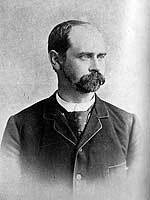 Born at Cherry Valley, Ontario on 4 November 1854, son of William Brock and Lucy (Adams) Blakely. Educated at the high schools of Picton and Napanee, and the Toronto Normal School, Blakely came to Winnipeg in 1881, passed a teachers examination, and began teaching in city schools. He was eventually placed in charge of the Central School, at the time the largest in the province. He later resigned to undertake studies in medicine, graduating from the University of Manitoba in 1889. Blakely was appointed Deputy Minister of Education in November 1889. He married Arminda Myrtal Law, daughter of Abraham Law of Richmond Hill, Ontario, on 24 September 1890. Mrs. Blakely was Manitoba president of the Women’s Christian Temperance Union.